Carotid endarterectomy (CEA), a preventable surgery, reduces the future risks of cerebrovascular stroWke in patients with marked carotid stenosis. Peri-operative management of such patients is challenging due to associated major co-morbidities and high incidence of peri-operative stroke and myocardial infarction. Both general anesthesia (GA) and local regional anesthesia (LRA) can be used with their pros and cons. Most developing countries as well as some developed countries usually perform CEA under GA because of technical easiness. 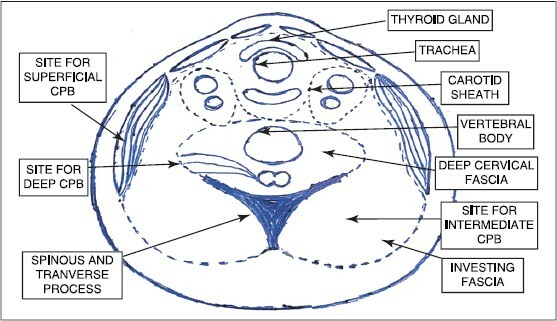 LRA usually comprises superficial, intermediate, deep cervical plexus block or a combination of these techniques. Deep block, particularly, is technically difficult and more complicated, whereas intermediate plexus block is technically easy and equally effective. We did CEA under a combination of GA and LRA using ropivacaine 0.375% with 1 mcg/kg dexmedetomidine (DEX) infiltration. In LRA, we gave combined superficial and intermediate cervical plexus block with infiltration at the incision site and along the lower border of mandible. We observed better hemodynamics in intraoperative as well as postoperative periods and an improved postoperative outcome of the patient. So, we concluded that combination of GA and LRA is a good anesthetic technique for CEA. Larger randomized prospective trials are needed to support our conclusion. Carotid endarterectomy (CEA) is a preventive surgery. Early operation (≤2 weeks) in symptomatic patients is useful. Patients undergoing CEA with co-morbidities having a higher incidence of coronary disease and prone to intraoperative hemodynamics fluctuation. So, anesthesiologists may encounter a high-risk patient with a minimum time for preoperative optimization. Both the intraoperative and postoperative periods are usually associated with major hemodynamic changes, leading to compromised cerebral or coronary circulation. The operation may be performed under local regional anesthesia (LRA) or general anesthesia (GA). Both the techniques have their own advantages and disadvantages, but without any difference in outcome. Currently, operations in the neck are usually performed under GA, mainly because anesthesiologists are more comfortable with secured airway in GA over regional anesthesia (RA). However, RA has several advantages compared with GA, such as better postoperative analgesia, faster recovery, lower costs, and lower morbidity and mortality rates. If LRA is the choice, CEA is typically approached via a combined superficial and deep cervical plexus (CP) block. LRA allows direct neurological monitoring in a conscious patient, but it is uncomfortable and stressful for the patient during surgery and is associated with technical complications, particularly with deep CP and cervical epidural block. Securing of airway and conversion into GA may be required at any point of time during the surgery. GA offers excellent operating conditions as well as some degree of neuroprotection during the period of cross-clamping of common carotid artery. Here, we report a case of CEA done under a combination of GA and LRA using ropivacaine 0.375% with 1 mcg/kg dexmedetomidine (DEX) infiltration. We observed better hemodynamics in intraoperative as well as postoperative periods and an improved postoperative outcome of the patient. To the best of our knowledge, DEX infiltration with local anesthetic in CEA surgery has not been reported so far. We decided to report the case after obtaining written informed consent. A 68- year-old male of weight 68 kg, who was a non-diabetic and a known hypertensive, and was taking telmisartan, atenolol, and amlodipine, presented to us. He had a history of coronary artery disease (CAD) for 3 years and was taking aspirin plus clopidogrel, isosorbide mononitrate, and atorvastatin. Carotid angiography showed 70% block in the right (Rt) side and 90% block in the left (Lt) side [Figure 1]. He presented with history of transient ischemic attack (TIA) 15 days ago, along with Rt-sided monoplegia of the upper limb. His general examination including vitals was unremarkable. Airway examination showed him to be edentulous, and other parameters were within normal limits. ECG showed left ventricular hypertrophy and inferior wall ischemia. Echocardiography revealed ejection fraction of 40-45% with mild diastolic dysfunction. He was premedicated with alprazolam and ranitidine, and all the drugs that he was taking, except telmisartan, were continued. In the operation theatre, all routine monitors including bispectral index (BIS) sensor were attached and arterial line was secured under LA. Baseline transcranial Doppler (TCD) was recorded. He was induced with fentanyl 100 mcg, propofol 80 mg, and vecuronium 6 mg. Anesthesia was maintained with sevoflurane in air/O 2 (35:65) plus vecuronium as a muscle relaxant, based on hemodynamics and BIS value. BP fluctuation was treated with phenylephrine and beta blocker/nitroglycerine as per the situation. Just after intubation, we performed ultrasound (Micromaxx Sonosite, Gurgaon, India)-guided intermediate and superficial CP nerve block with 5-10 MHz probe [Figure 2]. 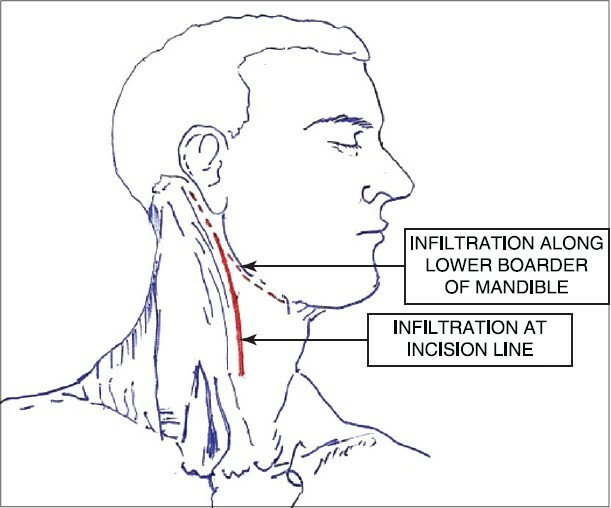 Then, before incision, the surgeon was asked to give the same drug along the incision line and parallel to the lower border of mandible [Figure 3]. Totally 25 ml of 0.375% ropivacine plus 75 mcg DEX was used in LRA. At the end of the operation, sevoflurane was stopped on completion of skin suturing. Patient was extubated safely following the criteria of extubation. Patient was monitored in the postoperative period for hemodynamics, saturation, ECG, analgesia, sedation, and neurological assessment up to 24 h. Patient was kept inside the neuro high-dependency unit up to 72 h after operation. We observed better hemodynamics intraoperatively with lesser fluctuation, less requirement of opioid analgesics, and stable heart rate (no tachycardia) and blood pressure. Also, there was lesser requirement of phenylephrine and hypotensive drugs and smooth emergence and recovery. In the postoperative period, we observed early neurological recovery, better postoperative hemodynamics, prolonged postoperative analgesia, and minimum requirement of rescue analgesia. Then, the patient was shifted to the ward and subsequently discharged on the 7 th postoperative day. Anesthesiologists should have a good knowledge of cerebral physiology and neck anatomy and a good understanding of the rapid pathophysiologic changes occurring during carotid artery manipulations for better management of and obtaining a good outcome in CEA. The major aims during GA for CEA are to preserve the cerebral circulation and oxygenation, provide cerebral protection, prevent myocardial ischemia, and prevent the patients from coughing and straining. In conclusion, we recommend a combination of GA and LRA using ropivacaine 0.375% with 1 mcg/kg DEX infiltration for CEA. Further prospective randomized trials are warranted to compare this new technique with the other available techniques. 1. Stoneham MD, Thompson JP. Arterial pressure management and carotid endarterectomy. Br J Anaesth 2009;102:442-52. 2. Lewis SC, Warlow CP, Bodenham AR, Colam B, Rothwell PM, Torgerson D, et al. General anesthesia versus local anesthesia for carotid surgery (GALA): A multicentre, randomised controlled trial. Lancet 2008;372:2132-42. 3. Griffin J, Nicholls B. Ultrasound in regional anesthesia. Anesthesia 2010;65:1-12. 4. Payne RS, Akca O, Roewer N, Schurr A, Kehl F. Sevoflurane-induced preconditioning protects against cerebral ischemic neuronal damage in rats. Brain Res 2005;1034:147-52. 5. Motamed C, Motamed-Kazerounian G, Merle JC, Dumérat M, Yakhou L, Vodinh J, et al. Cardiactroponin I assessment and late cardiac complications after carotid stenting or endarterectomy. J Vasc Surg 2005;41:769-74. 6. Winnie AP, Ramamurthy S, Durrani Z, Radonjic R. Interscalene cervical plexus block: A single-injection technic. Anesth Analg 1975;54:370-5. 7. Telford RJ, Stoneham MD. Correct nomenclature of superficial cervical plexus blocks. Br J Anaesth 2004;92:775-6. 8. Stoneham MD, Knighton JD. Regional anesthesia for carotid endarterectomy. Br J Anaesth 1999;82:910-9. 9. Pandit JJ, Satya-Krishna R, Gration P. Superficial or deep cervical plexus block for carotid endarterectomy: A systematic review of complications. Br J Anaesth 2007;99:159-69. 10. Bonnet F, Derosier JP, Pluskwa F, Abhay K, Gaillard A. Cervical epidural anesthesia for carotid artery surgery. Can J Anaesth 1990;37:353-8. 11. Kaisti KK, Metsähonkala L, Teräs M, Oikonen V, Aalto S, Jääskeläinen S, et al. Effects of surgical levels of propofol and sevoflurane anesthesia on cerebral blood flow in healthy subjects studied with positron emission tomography. Anesthesiology 2002;96:1358-70. 12. 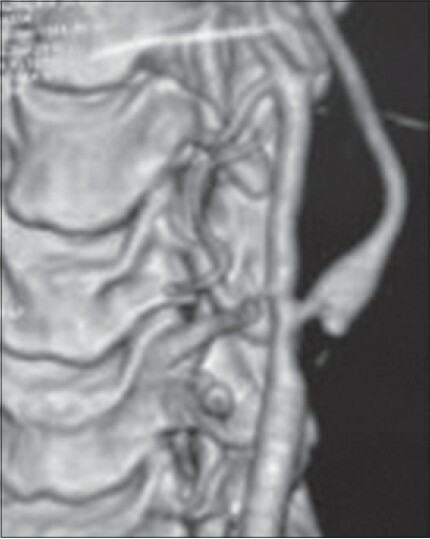 Kefalianakis F, Koeppel T, Geldner G, Gahlen J. Carotidsurgery in ultrasound-guided anesthesia of the regio colli lateralis. Anasthesiol Intensivmed Notfallmed Schmerzther 2005;40:576-81. 13. Perisanidis C, Saranteas T, Kostopanagiotou T. Ultrasound-guided combined intermediate and deep cervical plexus nerve block for regional anesthesia in oral andmaxillofacial surgery. Dentomaxillofac Radiol 2013;42:29945724. 14. Tonkovi D, Pavlovi BD, Sakan S, Baronica R, Martinovi ŽE, Drvar ŽE. 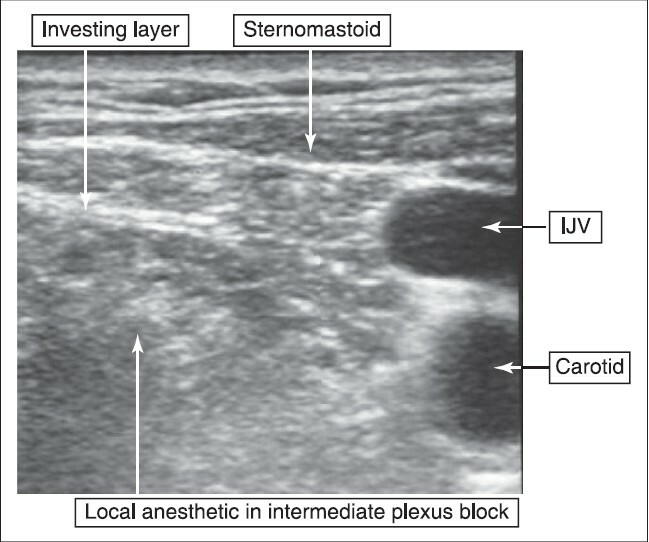 Intermediate cervical plexus block for carotid endarterectomy in high risk patients. Period biol. 2009;111,:231-4. 15. Cheung CW, Ng KF, Choi WS, Chiu WK, Ying CL, Irwin MG. Evaluation of the analgesic efficacy of local dexmedetomidine application. Clin J Pain 2011;27:377-82. 16. Yoshitomi T, Kohjitani A, Maeda S, Higuchi H, Shimada M, Miyawaki T. Dexmedetomidine enhances the local anesthetic action of lidocaine via an alpha-2A adrenoceptor. Anesth Analg 2008;107:96-101. 17. Esmaoglu A, Yegenoglu F, Akin A, Turk CY. Dexmedetomidine added to levobupivacaine prolongs axillary brachial plexus block. Anesth Analg 2010;111:1548-51. 18. Brummett CM, Padda A, Amadeo FS, Welch KB, Lydic R. Perineural dexmedetomidine added to ropivacaine causes a dose-dependent increase in the duration of thermal antinociception in sciatic nerve block in rat. Anesthesiology 2009;111:1111-9. 19. Ramadhyani U, Park JL, Carollo DS, Waterman RS, Nossaman BD. Dexmedetomidine: Clinical application as an adjunct for intravenous regional anesthesia. Anesthesiol Clin 2010;28:709-22. 20. Al-Metwalli RR, Mowafi HA, Ismail SA, Siddiqui AK, Al-Ghamdi AM, Shafi MA, et al. Effect of intra-articular dexmedetomidine on postoperative analgesia after arthroscopic knee surgery. Br J Anaesth 2008;101:395-9.